There will be NO Walk-In Registration for Soccer. Please register ONLINE! For Fall Soccer Registration, make sure you enter your child's grade for the upcoming 2018-2019year! After you log in to Community Pass, select the following organization under Register NOW! Please review and update your account information in Community Pass! Email notification is the #1 way that we are communicating about tryouts/evaluations, coaching, cancellations etc. Please take an extra step to check your Primary Contact info. (Click on View Account after you log in). If you wish to have BOTH mom AND dad receive communications, please fill in the field “Alternate Email 1”. Should you want to add your work email, you can use “Alternate Email 2”. 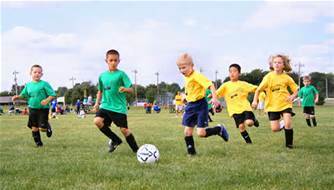 More information about Fall Soccer under Programs-Fall Sports.